Travelling down the west coast of Sweden? This is the tale of the reconnaissance run to help plan the reliability run, using a Hillman Imp. In the Winter of 1952, a four litre Humber Super Snipe pilotted by four professionals, including Stirling Moss and Leslie Johnson, travelled non-stop from Oslo, the capital of Norway, down to Lisbon in Portugal, passing through 15 countries on its way. This in itself was a remarkable long distance drive, but when it is learned that this distance of something approaching 4,000 miles was covered in a little under 90 hours, then it serves as proof of the wonderful reliability and performance of a then modern luxury car. 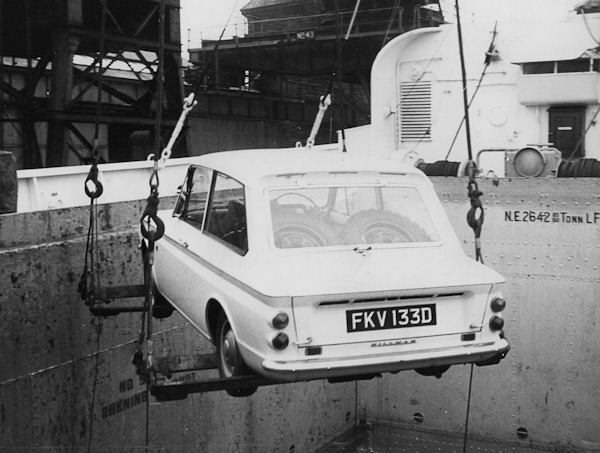 Ever since the introduction of the Hillman Imp in 1963, certain people at the Coventry factory have wanted to repeat this run. 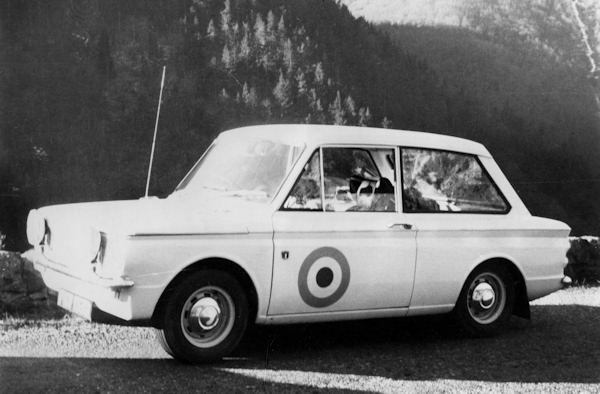 They believe that what was done in 1952 with a 4 litre car, could be equalled, if not bettered in 1966 with the under one litre engine of the Hillman Imp. Consequently when the factory was approached by the R.A.F. Motor Sports Association earlier this year with the idea of attempting such a run, the plan was put forward with enthusiasm for the approval of the Directors. The Honorable Brian Rootes liked the idea and authorised the factory to back the R.A.F. 100% in their effort. The whole project was then handed over to Norman Garrad and his team who began the organisation of the operation. As will be appreciated when planning a venture of this magnitude, it is necessary to go through every point of detail to discover and erase any likely difficulties or obstructions, however small. Detailed planning began with the mamouth task of plotting the route, checking the road conditions, times of ferries, frontier points and many other vital details. Continental dealers were informed of when en where assistance would be required and last, but by no means least, the car - an absolutely standard Hillman Imp de Luxe, 875 c.c. - was thoroughly prepared by the factory Service Department. Within 10 days of receiving the 'go ahead' everything was ready for the next stage of operation. This was to consist of an extensive reconnaissance run to check the route, road conditions and time, as well to establish interest amongst the foreign dealers. Accordingly, on the afternoon of Tuesday March 1st, the Imp, driven by Peter Brown of Rootes and Flight Lieutenant J.A. Quilley, one of the R.A.F. team, boarded the M.S. Blenheim bound for Oslo. Two days and 508 miles later, on March 3rd, the ship docked at Oslo after weathering the rough North Sea, and the packed ice of the Oslo fjord. The time was 6.00 AM, the weather 32 degrees below freezing and snowing. 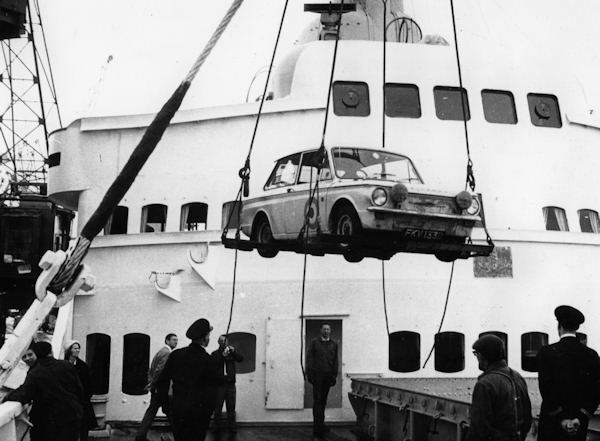 As the Imp was lowered gently onto the quayside, to be met by a representative of our Rootes dealer in Oslo, Kolberg Caspary, the car was given a final check over before leaving that evening for the border town of Halden, where the 'recce' run was to start the folowing morning. 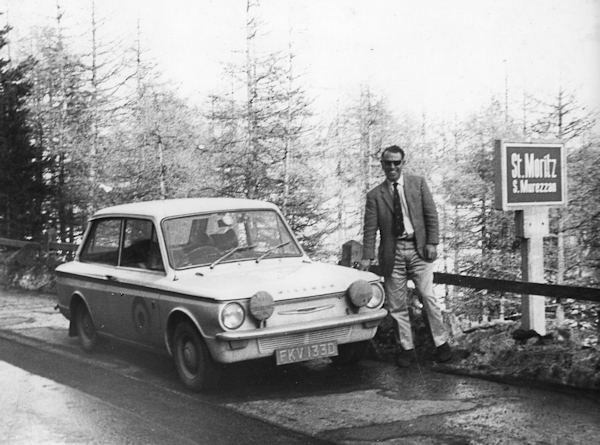 Friday March 4th, 7.00 AM, and the little Hillman sets out towards the Swedish border and eventually Andorra, 2,500 miles further down the road. The conditions were fair and the deserted roads provided a good fast run down the west coast of Sweden to the first ferry at Halsingborg. Fortunately the crossing had recently been freed from the grip of ice, and services were almost back to normal. After landing at Halsinger the road runs through the Danish capital, Copenhagen, and down to the last ferry at Rodbyhavn. The Puttgarten landing makes the entry into Germany and from here the road runs through forest and agricultural land to join over 400 miles of autobahn bypassing Hamburg, Hanover and Cologne. This section is a severe test to the car as it cruises at maintained high speeds averaging 63 m.p.h. Nearly 1,000 miles is now behind the Imp. Continuing from Cologne, the road rises from the Rhine valley over pave' into Aachen and across the Dutch frontier through Maastricht, in Liege (Belgium) on towards Bastogne, scent of bitter wartime fighting, and into Luxembourg. The river Moselle is crossed at Metz (France) before the Imp travels through Nancy and climbs 2,400 ft. into the Vosges foothills as the Swiss frontier at Basel comes into sight. Basle is reached at 11:30 AM on Sunday 6th March, and the hotel is a welcome sight after almost 28 hours continuous travelling. The target average of 40 m.p.h. is easily bettered at this stage of the journey. From Basle to Zurich and along the southern shore of the lake through Sargans, and into Liechtenstein, the smallest country in Europe. Onwards then to Austria, the 11th country to be visited, and from here the road winds its way over the Tyrol through the fashionable ski resorts of St. Anton and St. Moritz. Once over the Italian border the road drops down and runs alongside the picturesque Lake Como. 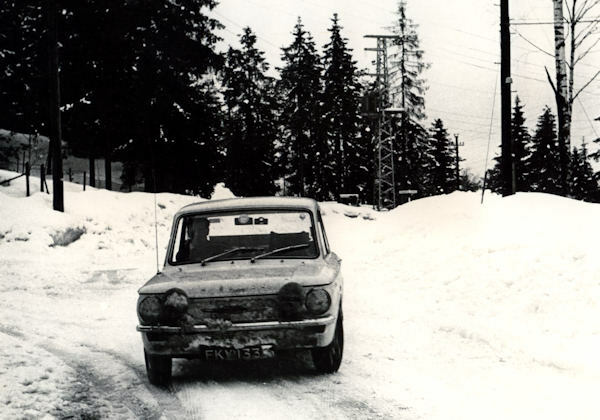 This part of the recce' was unfortunately navigated on a Sunday afternoon and enormous traffic build ups were experienced through Lecco, continuing almost to Milan. From Milan the fast smooth autostrada to Genoa, where the Sunday night 6th March was spent. Monday morning and the crew set out without the usual Monday morning blues for a pleasant drive along the Mediteranean coast to Monte Carlo, to meet up with Mr. Norman Garrad and the camera crew. Monday afternoon was spent on the terrace of the Hotel Metropole discussing the recce' run so far, and of course, an evening at Monte Carlo would not be complete without a visit to the famous casino. Back to work and 9.30 AM on Tuesday the Imp leaves the hotel forecourt, this time shadowed by the Humber Imperial film car, driven by I.D. 'Tiny' Lewis and containing the Film Director Stanley Schofield. The day is spent along the coast and later in the Pyrennes filming the Imp's antics as it motors swiftly towards Prades for the night stop, Tuesday 8th March. Wednesday 9th, and the final stage to Andorra. The road twists and winds its way up through the Pyrennes to a height og 9,000 ft, and the small border post at the top. This was to be the official end of the recce' run and so, after a short shopping spree, and a large lunch in the magnificent Andorra Park Hotel, the team sat down to discuss the run in detail. They were well pleased when they learnt that the distance of 2,500 miles had been covered in 51 hours actual travelling time, with a fuel consumption approaching 35 m.p.g. From this recce' run, it was now possible to form a far more accurate picture of how things woul go on the actual run. The puzzle was now sorting itself out and many of the numerous questions could be answered. Satisfied with their efforts the team returned to England with all speed. The road from southern France to the northern coast is straight and fast. The crew motored hard to reach the famous town of Le Mans by Thursday night 10th March, where they stayed at the Hotel de Paris, the centre of activity during race week. An early start the next morning enabled them to reach the airport at Le Touquet by lunch-time and after a brief bumpy flight they were touching down at Lydd, near Hastings, back once more on the home ground. So ended a large step in the planning of Operation Europe, and following a week of intensive planning and discussions before the actual attempt was made. The most suitable date to start, it was decided, would be March 29th, 5.00 am from Oslo. but allows 30 minutes for any unexpected delay. the earlier ferry (1450) may be caught. An extra 5 minutes has been allowed to make contact with the support car. Both the table and the 'story' are on plain paper (rather narrow and longer than letter-size), no header, no date nor signature present.